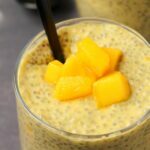 Creamy mango chia pudding. This perfectly sweet and delicious pudding is only 4-ingredients and so healthy it doubles as breakfast or dessert. Vegan and Gluten-Free. Add the flesh of one of the mangos to the blender or food processor and process into a purée. Chop the other mango into chunks. Add the chia seeds, coconut milk, maple syrup and puréed mango to a mixing bowl and whisk together. Then add in the chopped mango and mix it in, saving a few chunks to use for a topping. Place the mixture into the fridge for 15 minutes and then bring it out and give it a stir and then put it back into the fridge for another 15 minutes. Spoon it out into four serving glasses, top with the remaining chunks of chopped mango and serve. *We used full fat canned coconut milk. *Another sweetener can be used other than maple syrup. *Prep time includes the time spent setting in the fridge.